So you’ve decided to improve your website by using ElasticPress.io, and you’re wondering how to get started. Wonder no more – here are the first steps to start taking advantage of your ElasticPress.io account. 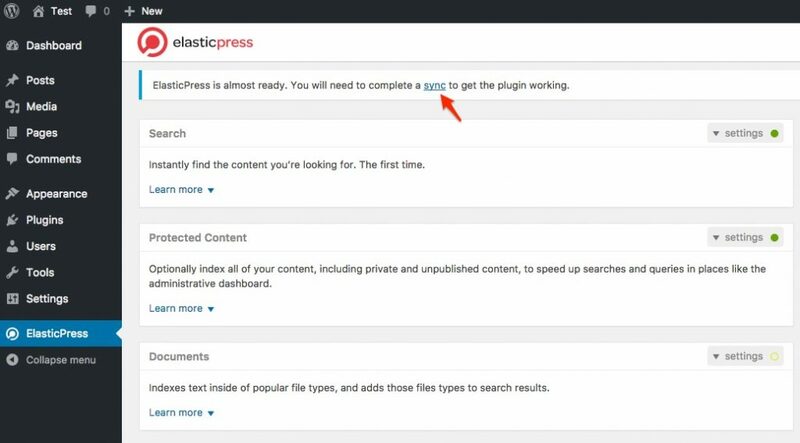 While you can connect to your ElasticPress.io endpoint with any Elasticsearch client, our ElasticPress plugin is the officially supported integration for our hosted service, and is the best way to integrate WordPress with Elasticsearch. Install the plugin using the Add Plugins screen in the WordPress administrative dashboard, or download a zipped up version via Github and upload it using the Upload Plugin option. Activate the plugin (network activate for multisite). In order to complete this step, you will need your ElasticPress.io credentials and endpoint, which are emailed to you after you setup your account. Once complete, ElasticPress is ready to go, and you should see an ElasticPress icon in your WordPress administrative dashboard menu. Indexing using the WordPress dashboard interface is easy: click the “sync” link in the dashboard notification that appears after activating the plugin. You can reindex at any time by clicking the “circular arrows” icon found in the header of the ElasticPress settings page. In some situations, such as a large website with an extremely high volume of content to index, command line indexing is preferred. The ElasticPress plugin includes a WP-CLI command, which uses the WP-CLI interface on the shell of your hosting setup. Note that not all hosting providers offer this option, particularly economy plans. As the invocation of WP-CLI may vary from provider to provider, we will use the most common, direct access via SSH shell, for this example. The elasticpress WP-CLI command offers various options which are listed out when calling the command without additional arguments. See 'wp help elasticpress <command>' for more information on a specific command. To index your site, run the index command. Processed 350/1002 entries. . . Processed 700/1002 entries. . . Processed 1002/1002 entries. . .
To index all of the sites in a network (multisite) implementation, append the –network-wide option to the command above. Once your content is indexed, ElasticPress will seamlessly kick in behind the scenes and intelligently route requests to ElasticPress.io. Depending on which features you enabled in the settings screen, the plugin will improve everything from the quality of search results to faceted product browsing speed in WooCommerce, and can add related posts or the contents of uploaded documents to search results. Whether for your own curiosity or for debugging purposes, if you want a glimpse into ElasticPress.io queries you can install the Debug Bar and Debug Bar ElasticPress plugins to see “under the hood” as content is pulled from the ElasticPress index. We’ve previously covered some debugging tips on our blog. While ElasticPress covers the most common use cases out of the box, unleashing its full potential involves customizing your site build and use case to run sophisticated WP_Query requests through the ElasticPress.io index instead of MySQL. In addition to supercharging the performance of heavy data queries, ElasticPress enables complex queries not supported by WordPress core, for instance cross-site queries on network/multisite installations. More experienced developers can find an introduction to these capabilities on the ElasticPress GitHub page. The ElasticPress plugin offers a huge variety of filters and actions empowering developers to alter its default behavior and introduce custom weighting schemes or similar alterations. These filters can be discovered by searching through the open source ElasticPress code base. Finally, you can also use the ep_remote_request() function (added by the ElasticPress plugin) to send raw Elasticsearch queries directly to the ElasticPress.io endpoint. This provides access to most of the features outlined in the Elasticsearch documentation. ElasticPress.io includes support, so if you’re having trouble following our setup, or an expected feature has gone awry, we’re here to help. Offer training and support for internal teams learning ElasticPress or Elasticsearch. Just use our contact form and tell us how we can help. ElasticPress is a fast and flexible search and query engine for WordPress.